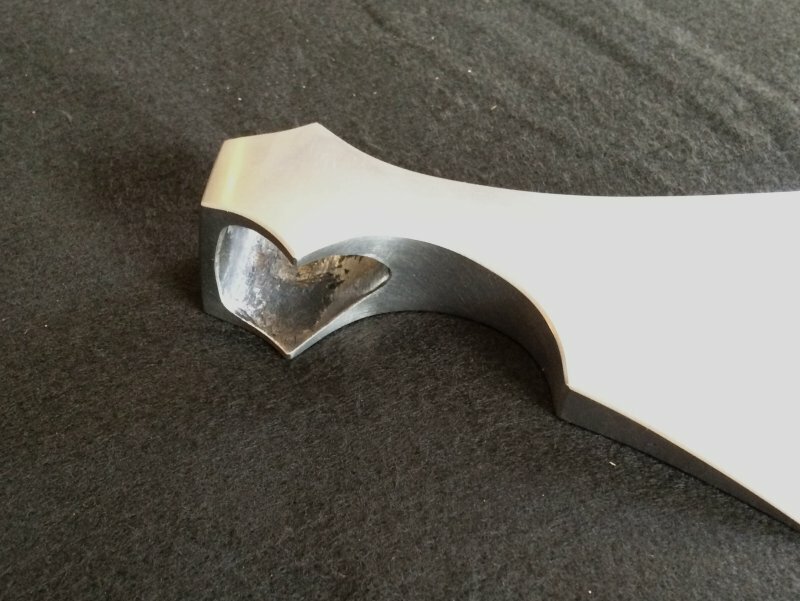 I’m getting ready to polish a small bearded axe that is inspired by an axe that I documented with Swordsmith Peter Johnsson in Uppsala, Sweden. 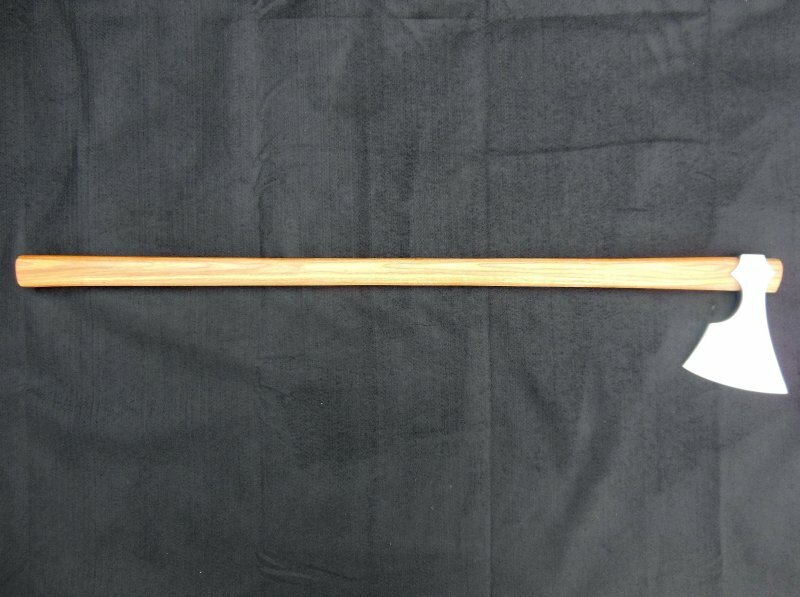 We were drawn to this axe because of it’s elegant lines, and stout shape. 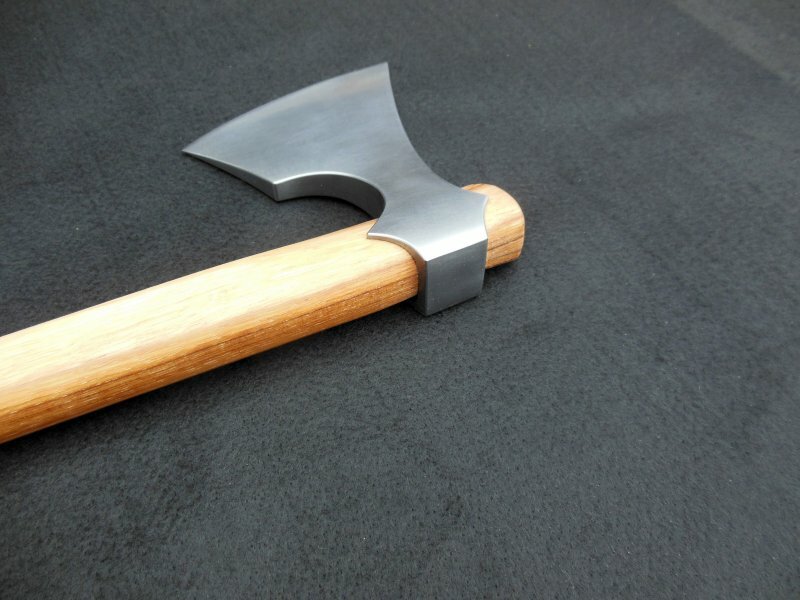 While it’s profile makes it look like a thin axe, when viewed from the top, it is clear that this axe is all business. The body is nearly wedge shaped. The body and socket are 1018 and the bit is 1080. Blade width is 4.75″ (12,1 cm) from tip-to-tip. It is 6.25″ (15,9 cm) long. That is a very nice looking blade. The lines/angles remind me of a modern "americanized" tanto blade. Any theories as to whether there was a specific functional purpose for this design? Does it have much of an effect on the weight distribution? Does this shape put more mass in middle portion "in line" from the shaft and less in the lower portion? 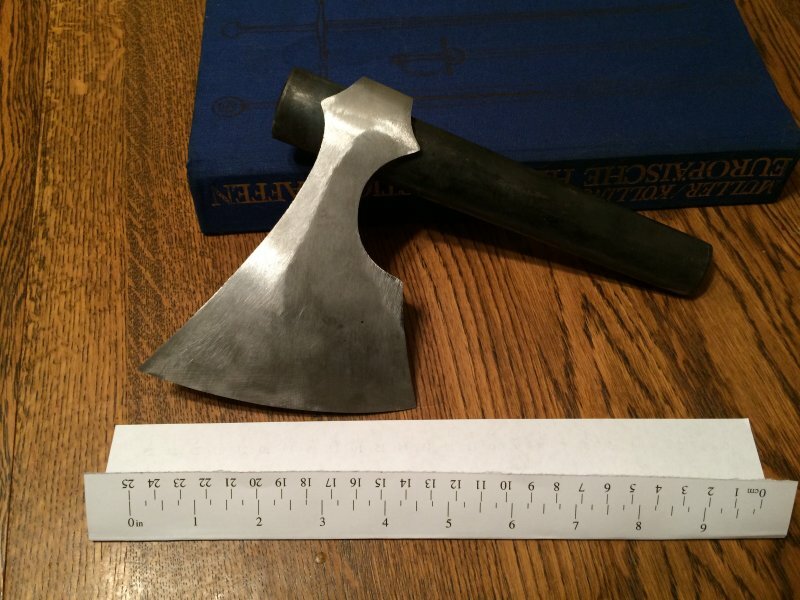 I don't know much about axes but this has me intrigued. I'm not sure about mass distribution, but I think this design, in a basic sense, gives this axe a much more potent punch. The design basically supports the cutting edge by putting a lot of mass and reinforce behind the edge. 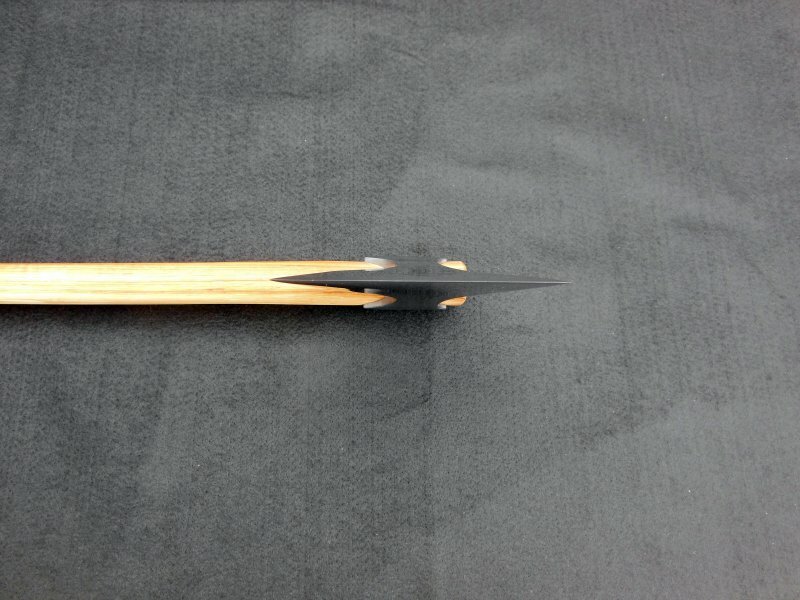 I plan on giving it a rather keen edge because the angle will provided a lot of support for a keenly sharpened edge. On the battlefield, this axe would have been quite a fast and agile cleaver. That extra ridge does look like it could add some reinforcement. I've always liked the "bearded" look and this is a slightly different take I have not seen (or noticed) before. Very cool. That extra ridge does look like it could add some reinforcement. I'm sorry, but I think what you are thinking is a ridge is just the grind pattern moving in different directions. This is the problem with showing WIP pictures. Basically, I used a low grit best to remove forge scale. Because it is so course, it really shows the change in directions. 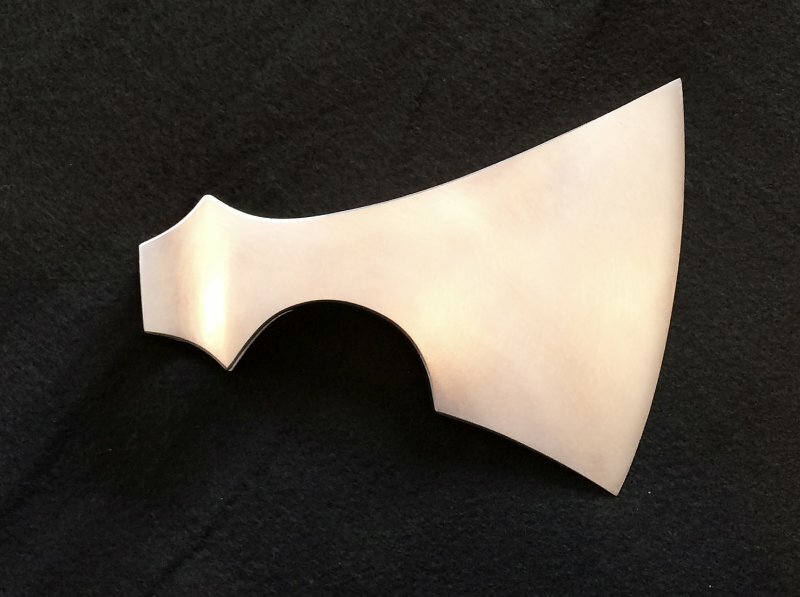 The axe head is a flat wedge shape with a slight taper to the edge. OK, interesting. Yeah, I really thought those were shadows cast by the shape of the blade. Thanks for clearing that up. 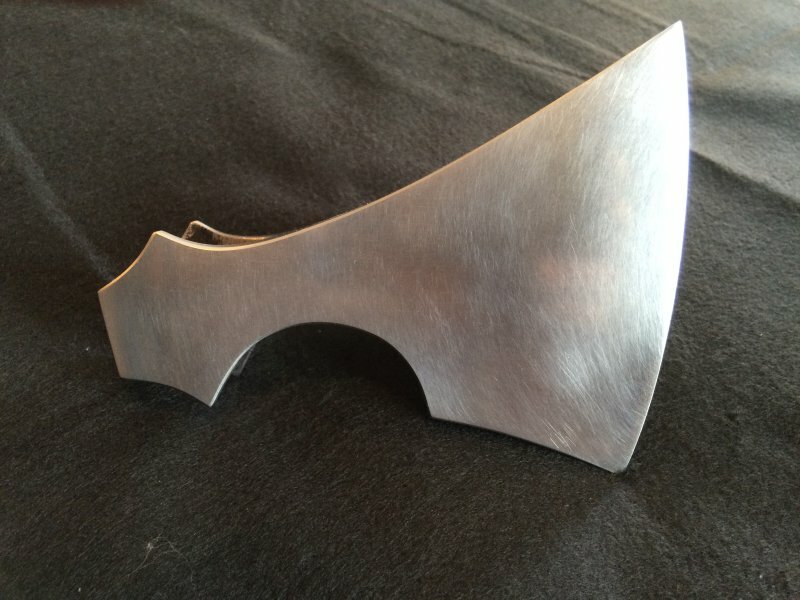 Maybe just an artifact of grind marks and lighting but an axe head with such a ridge does look attractive to me, but might not be historically valid if keeping to making only period appropriate axe heads, but for a more fantasy piece it might be interesting to make an axe with such a ridge. In any case the actual design does look good. Spent the last few days polishing this bearded axe. 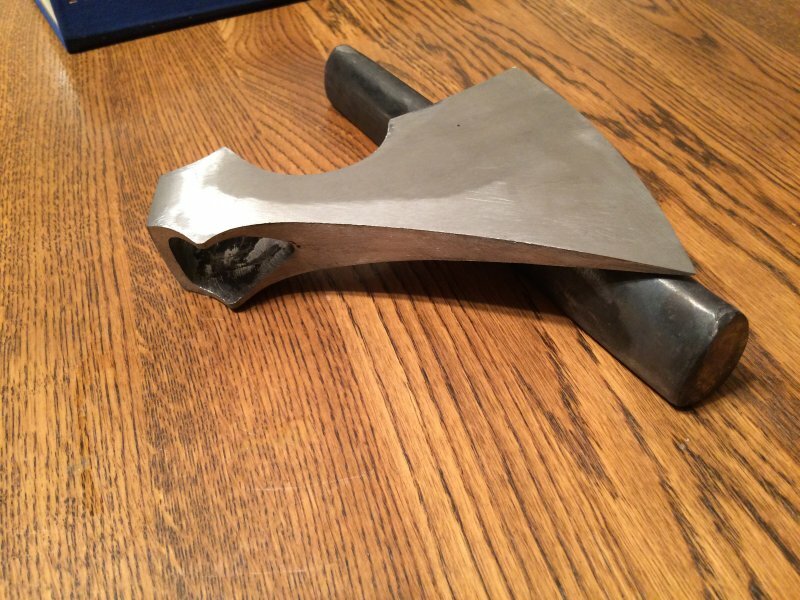 It's now ready to be hafted. I call this finish "file satin." Basically, I forge the axe as closely as I can to the shape I want. I leave a little extra meat for the grinder. I then give it a very course grinding to remove scale and pits. 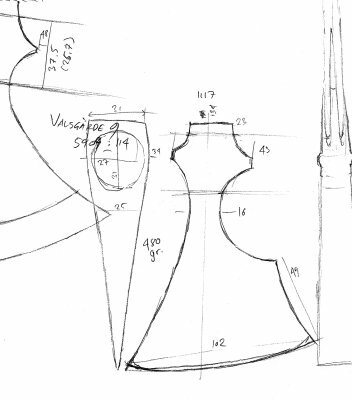 I then draw file to the final shape I want. This is followed by hand polishing with wet/dry paper then emery compound. Finally, I use oil on a scotch-brite pad and satin the whole thing. This gives a very well defined shape, but upon closer inspection small forge pits and file marks are evident to add historic character. I do some final shaping of the socket to ensure a nice fit with the haft, and then put a small chamfer on the edges. 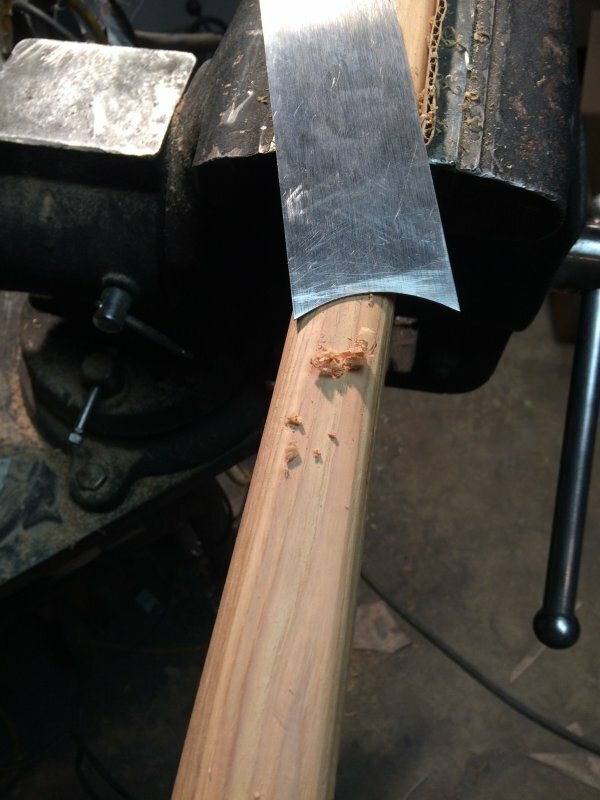 While most of the examples I've seen are too corroded to support the idea of this small chamfer, I do it because it adds a little depth to the axe head, and protects the user from cutting his or her fingers on the hard edges. Considering the amount of file work you see on many historic weapons, I think it is historically plausible. The edge is hand polished to sharpness with stones. 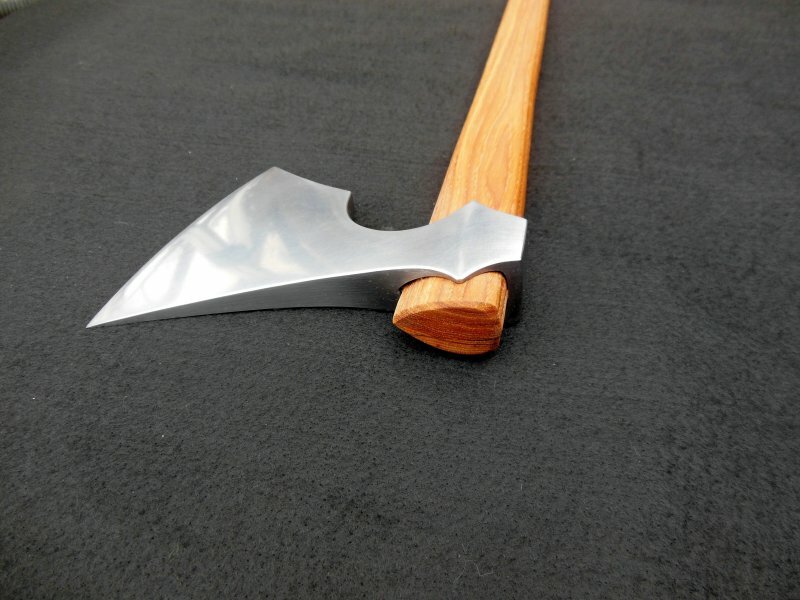 I am looking for a slight apple seed bevel, but because of the wedge shaped design of this axe, the apple seed bevel is very small because the wedge shape of the axe will naturally support an aggressive cutting edge without too much meat behind the edge. 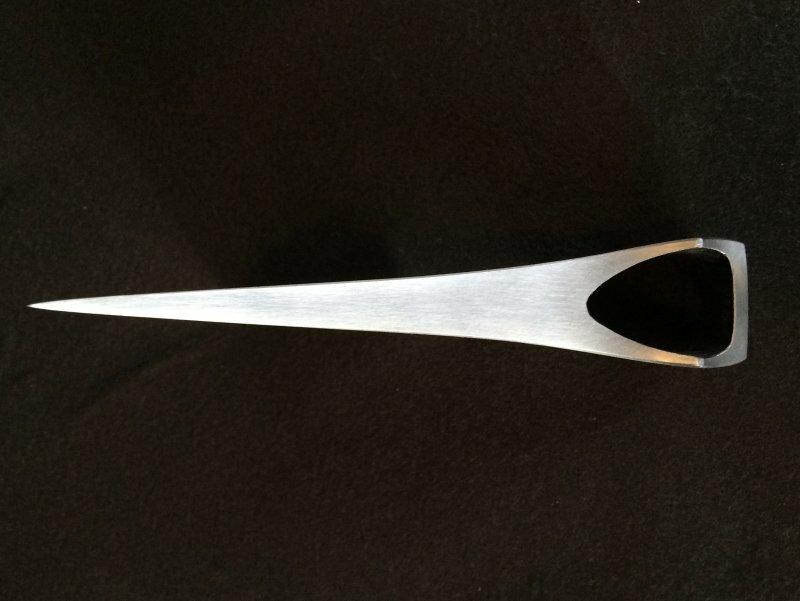 This design allows for an extremely sharp edge that is well supported. This axe could do some real damage to an opponent's shield or person. I do the final sharpening with a high grit diamond hone followed by a leather strop which makes a hair shaving edge. I'll post final pictures after it has been hafted. I've learned that it is the little details that make the difference between an average item and something that is pleasing to the eye. I use cabinet scrapers to achieve a smooth and symmetrical shape to the haft. It is a small detail but it adds a nice touch to the overall appeal of the project. 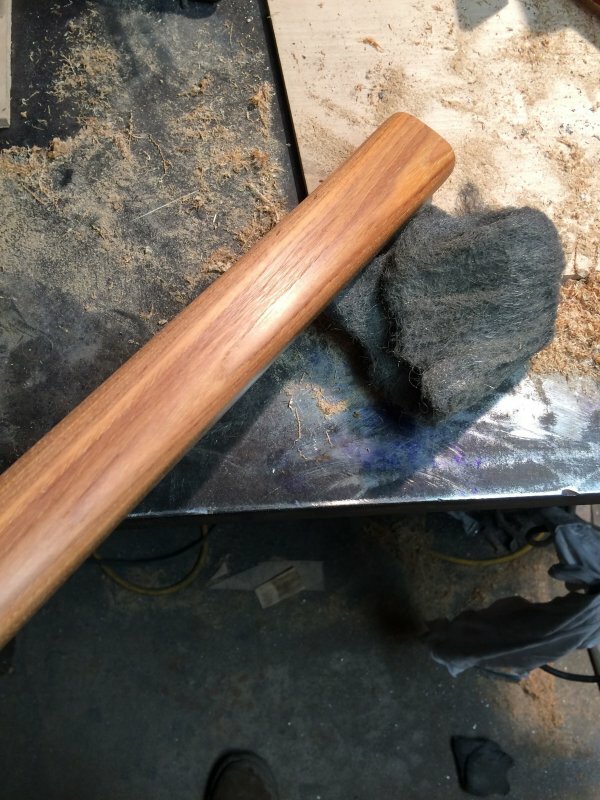 You have to learn to correctly develop a nice burr on the scraper so it gives you these nice thin shavings that do not remove too much material and smooth the shape at the same time. I'm not sure if this stuff is of interest to most folks, but I figure I'll keep posting WIP pictures until people tell me to "F" off...LOL. I don't think I've posted directly about any of your previous works because it usually doesn't fall into the scope of my immediate interests. However, please do continue posting about the work progress and don't hesitate to do so with future projects! 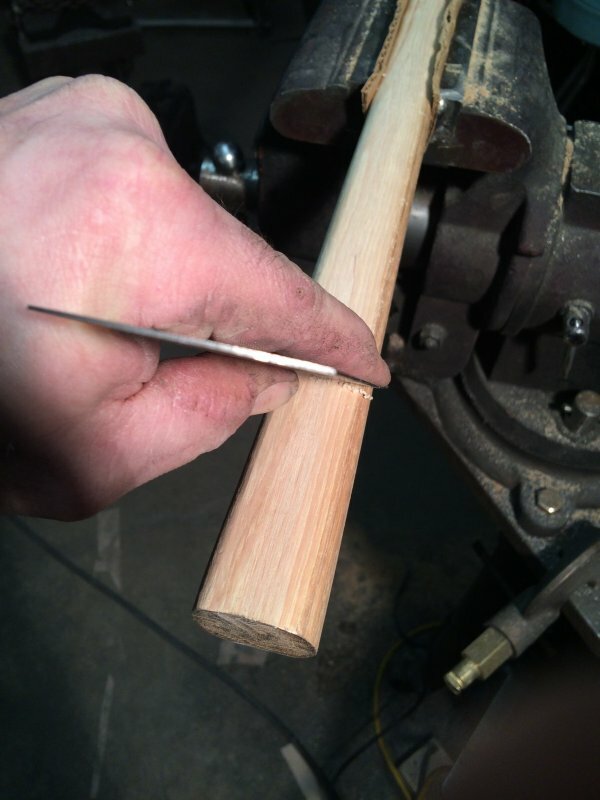 A lot of us here busy ourselves with making our own weapon shafts and the like... So it's fascinating to see the details build up to a finished product. The only thing you may hesitate about is giving away too many secrets and wind up having your customers doing all of the handiwork! Cheers! Thanks, but really there are no secrets. I don't mind sharing. Beside (and this is not meant to be arrogant) it is one thing to see how something is done, and another to have built up the skills to execute the step. It's like me with Peter Johnsson or Kevin Cashen. I am friends with both, and they share loads of stuff with me, but until I try it out and fail numerous time, it is just an intellectual exercise. One thing I've learned it that things that look easy are often deceptively difficult. Also, I didn't share all the other steps I did to get to where I am in those pictures. Honestly, I've messed up enough hafts (mostly making the part that goes into the socket) that I finally have figured out a way to make them fit nice, but even then there are small gaps because when you forge the eye (and not machine it) there are small imperfections that resist perfection. In the end, there is a harmony that can be achieved where small human flaws (or character marks) are part of the harmony that make a piece look good. I look at swords in museums, and they are exquisite, but when you measure them, it is clear that there is a lot a asymmetry, but the whole thing comes together and just looks "right." That is what I'm trying to achieve: not physical perfection, but a aesthetic or visual perfection. I was talking about trade secrets, Eric! Not personal ones. Ha, ha. I know what you mean. I do leather and wood work on a semi-professional basis and am still a young man with lots to learn. It takes a lot of trial and error to correctly mimic the craftsmanship of the ancient and medieval artisans whose work I try to replicate. However, once the trials are overcome the barriers are broken.... There might not be secrets per se, but personal style and execution are also valid concerns. A technique you have pride in to give that unique finish to your work is something that you should not take too lightly. Cheers! Almost finished. One more final coat of linseed oil. I put three coats of linseed oil on it. I use 0000 wool after each coat dries. The oil raises the grain a tiny bit, and the steel wool polishes to this nice semi-gloss look. Man that's looking mighty good... cant wait to see that puppy all together!! It was a chance of a lifetime. My friend, Peter Johnsson, was able to secure a whole day of research at the University of Uppsala storeroom. When we walked in, the curators made their introductions, then proceeded to walk us down to the climate controlled rooms.I could not believe my eyes: row after row of swords, spears, axes, and other assorted weapons were sitting on each shelf. It looked to me, a novice, like the jackpot of historic weapons. We quickly began the task of choosing which items we wanted to document. We pulled what seemed like dozens of weapons off the shelves and placed them on a cart to take them to a study room. One of them was this outstanding small bearded axe. It had an elegant shape, but it was also quite substantial for its size. 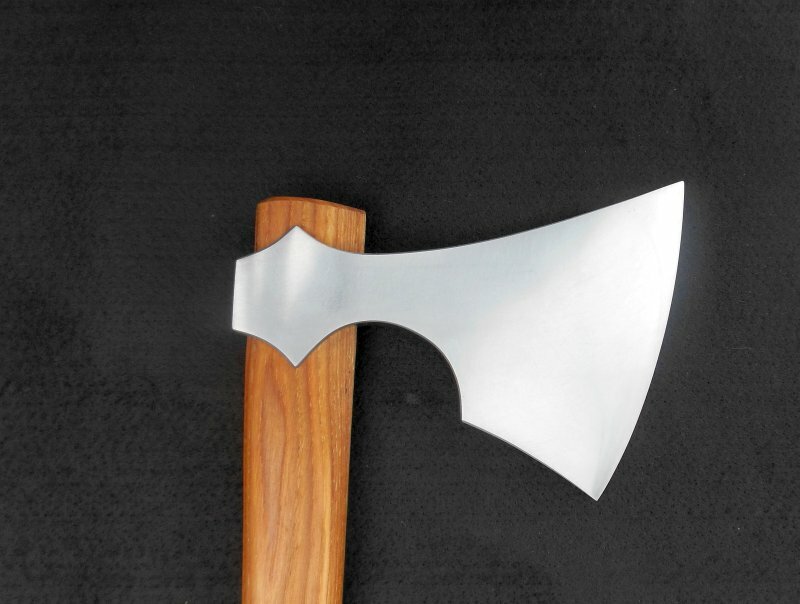 I knew right away that someday I’d like to make an axe inspired by this one.